(Nanowerk News) Inside the trillions of cells that make up the human body, things are rarely silent. Molecules are constantly being made, moved, and modified--and during these processes, mistakes are sometimes made. Strands of DNA, for instance, can break for any number of reasons, such as exposure to UV radiation, or mechanical stress on the chromosomes into which our genetic material is packaged. To make sure cells stay alive and multiply properly, the body relies on a number of mechanisms to fix such damage. Although researchers have been studying DNA repair for decades, much remains unknown about this fundamental process of life--and in a study published online in Nature Chemical Biology on September 7 ("Chemical proteomics reveals a γH2AX-53BP1 interaction in the DNA damage response"), researchers at The Rockefeller University uncover new aspects of it. 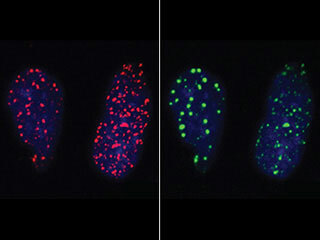 Repair process spotted: In these cells, whose DNA has been damaged by radiation, the histone protein γH2AX (red) accumulates at sites of broken DNA strands. A new study shows that this histone recruits the protein 53BP1 (green) to help mend the damage. "Our findings are revealing more clues about the intricacies of DNA repair," says study author Ralph Kleiner, a postdoctoral fellow in the Laboratory of Chemistry and Cell Biology, led by Tarun Kapoor. "We now know how key proteins get where they need to be to facilitate the process." "This is also a nice example of how innovative chemical approaches can help decipher fundamental biological mechanisms," adds Kapoor, who serves as Pels Family Professor at Rockefeller. When DNA strands break, the cell ideally puts them back together and carries on as usual. But sometimes, repairs don't go that smoothly. For instance, different regions of a chromosome can fuse together, causing genes to rearrange themselves--and such chromosome fusions can lead to diseases such as cancer. To learn more about the process, Kapoor, Kleiner and their colleagues zeroed in on the sites in chromosomes where DNA repair happens. Specifically, they focused on a single histone, a type of protein that DNA wraps around to make up chromosomes. This histone, H2AX, is known to be involved in DNA repair. Immediately after DNA damage occurs, H2AX gets a mark--it becomes tagged with a chemical moiety known as a phosphate. This process, called phosphorylation, occurs at sites of broken DNA as a way to mediate interactions between key proteins. In the study, the researchers wanted to learn more about how phosphorylation of H2AX helps mediate DNA repair. The researchers employed a new method for scrutinizing the DNA repair process. To learn more about which proteins interact with H2AX when it becomes phosphorylated, they added their own light-sensitive chemical tags to a portion of the histone. This tag was designed such that it became activated only when the researchers shone a light upon it. Once activated, the tag reacts with interacting proteins, facilitating their capture and isolation. This technique enabled the researchers to identify not just the proteins that were known to strongly bind to H2AX and facilitate DNA repair, but also those that were considered "weak binders" as well, says Kleiner. Indeed, they found that part of a DNA repair protein known as 53BP1 fits over the phosphorylated part of H2AX "like a glove," says Kleiner. This interaction helps bring 53BP1 to the site of DNA damage, where it mediates the repair of double-stranded breaks in DNA by encouraging the repair machinery to glue the two ends back together. "We've identified a component of the DNA repair process that others had previously missed," notes Kleiner. "Scientists have known about 53BP1 for a long time, but didn't understand the function of this particular portion of the protein that interacts with the phosphorylation mark of H2AX. These findings help solve that mystery."